While I am sad about JL3001 I am excited about Scooby as well as Wacky Racers and Future Quest. The previews I have seen of the books looks awesome. Question; the most recent issue of JL3001, not the one coming out tomorrow, but the one before had some panels that seem dialogue heavy. Was that to help wrap up the storyline in a short period of time or just a particularly wordy story to tell in that issue? Just me running off at the mouth as usual, Douglas! Looking forward to picking up Scooby after work today. While I will miss the ongoing madcap fun that is JL3001, I have no doubt that you and your two talented colleagues will give us a wonderland in the new Scooby world. Thanks, Mike! Hope you enjoy it. We're having a lot of fun working on it. Glad to see a new book to read along the one I couldn't read anymore (snif) ! Love Scooby, and thrill to discover this new version, specially with you three telling this story ! 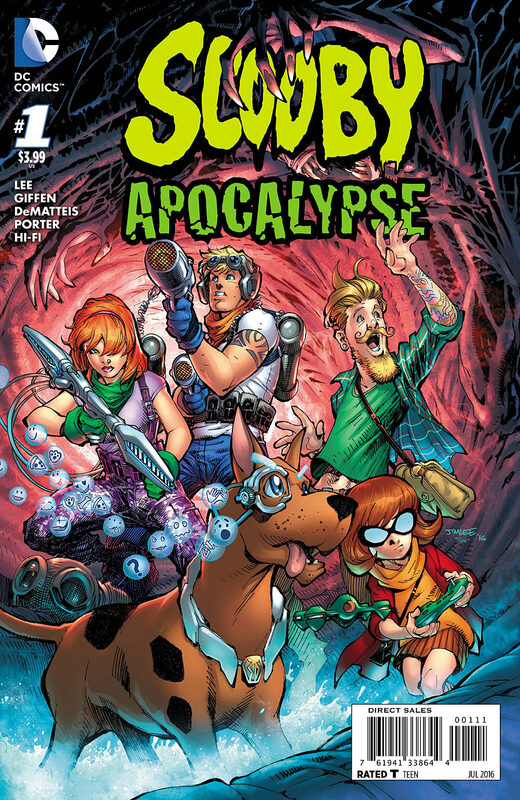 I'm REALLY gonna miss JL 3001, Frey...but I hope you enjoy our new take on SCOOBY. For a book that I was, initially, not fond of I will miss JL3001. The last panel is priceless. Scooby Apocalypse made me smile and I look forward to more. As for DC Rebirth that came out this week. It made me smile, it choked me up a little and, in the end I loved it. As a dyed in the wool Marvel Zombie I find it surprising that the older I get the more DC Comics makes me happy. The response to REBIRTH seems to be very positive, Douglas. I hope that bodes well for DC's future. Glad you enjoyed SCOOBY. Next issue, the action kicks into high gear. As for JL 3000/3001: I'll miss this book. It really felt like we were jut getting started. 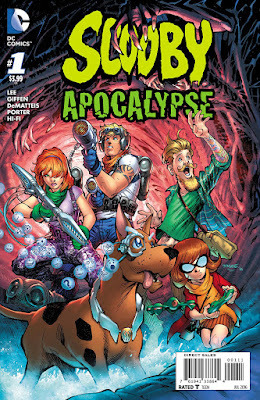 Oh, man, SCOOBY APOCALPYSE #1 is a blast. I really like the character dynamic you've set up here. Even though the setting is different, the characters feel consistent with the Mystery Machine Gang we've known and loved since childhood. I especially thought the way you set up the Scooby/Shaggy relationship is perfect, a contemporary spin with all the heart of the original, and a little more depth. I don't want to get into that too much for fear of spoiling, but it made me a little teary-eyed. I will swear it's allergies if anyone asks, but...oh, to heck with it. Yes, a Scooby comic has me choked up. My only (minor) complaint is that it felt a bit like 1/2 of a first issue. I suspect that if this were the 70s or 80s, the first and second issue would be a giant-sized #1, setting up the dynamic but showing the fully formed team in action, too. I feel like things will really kick into high gear next month, and I can't wait to see Porter's take on the apocalypse. The man is brilliant! You're right about the action kicking in next issue, David. It's full out monster madness. So glad you enjoyed it. I'm very grateful (and a little astonished) by the wildly positive reaction the book has been getting. And sales have been robust, as well, which doesn't hurt! I'm not surprised. You, Giffen, Porter (and I think, Lee?) have come up with a solid premise to honor the spirit of Scooby-Doo without the kind of familiarity that can breed indifference. I got to thinking about my minor complaint, and in all honesty, it was kind of silly. It's not unusual for pilots to be broken down into multiple parts--in fact, most television pilots are two to three episodes. Sometimes they get aired in one chunk on the premiere night, then broken up later, and sometimes they're always aired in segments. But our viewing (and reading) experiences have largely been altered by instant streaming and the emergence of the TPB. And the 80s thing is a reflex for me, though not always a good (or accurate) gauge. In all honesty, they probably would never have greenlit this bold of a spin on Scooby-Doo back then. One thing's for sure, the Giffen/DeMatteis team is better than it's ever been! Thanks, David. And your complaint isn't silly, if that's how you feel. With all the praise you've heaped on our heads, I'm not offended in the least! Doesn't this just raise the question of why you and Giffen never wrote for Looney Tunes? That DC comic has been around for a while, wouldn't that be perfect? The lack of grasping the obvious is Dithssspicaple! So... when you guys have you next meeting with DC we should all be vewy vewy quite? I's put a pin i this as soon as possible... cause I can do this all day, and twice on Sunday. Isn't it tempting to do the sequel to the Jack Benny episode? Doesn't the thought of someone doing it before you MAKE YOU SO MAD!? Can't wait till Sunday when you do it twice. I don't know Dematteis, I don't think its too off base to say that Mark Waid could be the spiritual successor to Mark Gruenwald. Both have a deep love of both major comic companies, both try to stress the importance of more classic heroism, I hear Gruenwald was really nice and I have experienced that Waid is both named Mark. I'm just saying I'm not sure it should be just shrugged off. Are we in the middle of a conversation that I completely missed? Your just going to have to use your best judgement on how to proceed. Its okay, we all have faith in you. Besides, starting at the beginning? Where is the fun in that. Think of it as a verbal Twilight Zone. Of course,we still haven't figured out if you missed anything or not. Oh, I get it. It's a cookbook! "Picture a man thrust into a conversation initiated by his doppleganger..."
As a child, I was horrified by "To Serve Mankind"! And I just assumed the classic WB characters would all be showing up in SCOOBY APOCALYPSE as monsters! Next issue: "BUGS BUNNY: RABID!" Why would I cook Mark Waid? more importantly, what recipe would call for both Waid and Gruenwald? What species wouldn't have a whole human as a main course in themselves? Why would the Looney Tunes be in a Hannah Barbera property? What is this Crisis on Infinite Saturday Mornings? WB owns Hanna Barbera...so all those characters are under the same umbrella. Which means the Huckleberry Hound/Sylvester the Cat face-off you've always dreamed of is now possible. I want the creepy robot from the original show to appear in the new comic book. Yeah, yeah I know I'm reaching again. Idea: Now here me out, J.M. Dematteis, Ann Nocenti, and Rick Veitch on ... Brother Power the Geek. If DC doesn't go for it a creator owned Gus, The Living Hippie. I know what your thinking, "a hippie project? We need Steve Gerber. HE was the most hippie comic creator of all." That's true, but he's dead. Throw in Michael Nezter on inks... and we have some Hippie magic. I think Steve Englehart gave Gerber a run for the money in the "hippie creator" sweepstakes. And, really, Gerber was so Gerber that in the end he's unclassifiable. GUS, THE LIVING HIPPIE? The mind boggles! No, Starlin is unclassifiable. Gerber is very classifiable, bitter ex-hippie who is angry about, (when not depressed about it)that his revolution didn't pan out. And constantly trying to convert people to his way of thinking. Until the day he died. There, classified. Englehart? I really like a lot of his work. It think his care for the Silver Surfer when the relaunched it is too soon forgotten. He started the usually followed policy that when you write the Surfer you have to bring it. I'm not sure I would say hippie. Sure, there were shades of it in the Celestial Madonna and Dr. Strange. Of course the acid may have created that. Look suddenly, he's the square guy talking about making it commercial. Ironic since he was the first one who wanted to bring back Brother Power. Writers: J.M. Dematteis and Ann Nocenti. Think of the bull-sessions every month. Of course the potential friction between Nocenti and Netzer would either create amazing creative power... or a need for a new inker. I don't know, your world Dematteis. You know, I have given so many great ideas here; The Beloved Spider-Man, Superman: Silver, Spider-Man: Exiled, Cap and Bernie: Domestic... Bliss, and nothing has come of it. If you pass up this gift wrapped Eisner-winning idea... I don't even know, okay I don't even know. Maybe comics deserve to die, I don't know. You know Dematteis, I'm sure you've heard by now about the last page of the most recent issue of Captain America, and even if you haven't it can't be that hard to look up. So, I have a question. I'm sure yo may have gotten this a lot or expecting to, and will fill it up with something like "yada yada yada, creator's visions, yada yada yada, time moves forward." That kind of non-answer, but please humor me and give your real opinion to me as someone who goes all the way back to the Amazon days. Isn't this exactly why he needs Bernie Rosenthal? A nice Jewish girl isn't going to let that fly. It wouldn't even reach the runway, and on the off chance it did, your looking at a very uncomfortable 6 months minimum of guilt among other things. This is just proof those bumper stickers are right, we need Bernie. If you had klistned to me way back when I first recommended the creation of Cap and Bernie: Domesitc... Bliss, at least the first issue would be out, probably the 5th, and no one would care about that ending. The cheers and parties celebrating Ms. Rosenthals' return would just be dying down next Tuesday. Hell, the main universe book probably would have started trying to have that Cap book moe like yours... just with less sitcom elements, around issue 3 page 5 panel 6. Bernie" "Not in MY house!" Steve: "Okay, forget I said anything." Hank Pym: Steve, why do you keep rubbing your neck like that? Captain America: I said something the wife didn't like last night, and had to sleep on the couch. Hank Pym: Why didn't you just say its your house, you paid for it, and you'll say whatever you want? Nice Jewish girls... saving the world from the forces of Fascism, one significant other at a time. See, this is what the world is missing out on. Maybe SHIELD needs to develop a new plan, Operation: Latke. Where every super-villain is put on JDate. Molecule Man stopped being a villain because of Volcana. LOL I think you guys are on to something here. And for some reason, I now want to see Elmer Fudd pop up in "BUGS BUNNY: RABID," drop an anvil on his hated nemesis' head, and run around screaming, "I AM THE WABBIT!" But we have to change the title to ELMER'S LAST HUNT. It's sure to go into multiple printings. And when is the last time you met anyone who named their kid Elmer? What immoital hand or eye, fwamed thy feawful, "What's up, Doc?" How will Elmer dress like Bugs? Since the subject has sort have been broached again... ell, not really, but close enough. Aunt May: Jewish. Absolutely. I know that there was some disagreement about how for sure it was. Yes, Ben, Richard, and Peter Parker are all pretty WASPy, but May is probably ewish, and isn't there one pretty big point that is rarely brogut up? Isn't Forrest Hills known for having a fairly prominent Jewish population? Or at least in teh 60s. This one is up to you Dematteis, you were the only one here who lived in New York at the time. Does this lead to me being accused of being a Nazi sympathizer again? Very hurtful. Did you ever notice there is never anything done with Peter's mother? Where are those relatives who want to see Peter? What about alerting them when Richard and Mary were presumed alive. Brooklyn and Queens were like different countries when I was growing up. I only knew parts of it...so I'm no expert on Forest Hills. Aunt May Jewish? They say her maiden name was Reilly, but I think May's mother was Jewish and she clearly absorbed her cultural and psychological traits. Either that or they modeled her on MY mother. Interesting point about Pete's Mom and her family. That's something I'd love to explore if I ever get to enter the Spiderverse again. I mean, at the very least, didn't Peter have cousins? And they say New Yorkers are distant. Its been a long time since I lived in that city, and admittedly it was a very short time, but aren't they right next to each other? Well, at least you guys had.. well I'm sure you can guess what comic character I'm going to say that you get to claim. Maybe Reilly is an Ellis Island handout, or she was adopted. According to Marvel.wikia.com, whose Mary Parker profile I checked out after bringing this up, Mary did have parents. Her mother died not long after she was born, and her father is listed as dead... but no details are given. Peter would only have cousins if Mary had siblings, and that seems unlikely. But it doesn't say there aren't any. Also HER maiden name was Fitzpatrick. Apparently the Parker man seem to have a thing for Irish women... or at least women with Irish last names. Come to think of it, MJ, despite an English/Scottish last name seems pretty Irish. or at least her hair. Curious. I always thought that deep down deep, maybe so deep you need oil drilling equipment to find it, Jameson liked Peter. Re: Brooklyn and Queens. Brooklyn is a huge city in itself and, when you're a kid, the only other world is Manhattan. I had relatives in Queens, but it was always a world of mystery to me. Re: Jameson. I don't think it's buried that deep. I'm sure he likes Peter. And enjoys busing his chops because...well, he's Jonah Jameson. Now explain why the Parker men love Irish women. As for Jonah, Once they undid the marriage I quickly lost interest. The stories just didn't work for me. I had picked up some issues here and there, and I would then do a little research on things I missed. So, I know exactly why Jonah is Jonah... his father was a jackass. Yeah Aunt May's husband is a pretty bad person and quite the opposite of her first. I don't know if an explanation for why was given, but I couldn't find any. What an I talking about there? The fact that he abandoned his wife and son, leaving them in the care of his abusive brother. I don't know if they explained that he knew, but he still remorselessly abandoned his kid and wife. And yes he dares talk down to Peter about being a responsible. Its just like Close Encounters, which is a movie with a terrible, terrible lesson. I've heard people say it is the ultimate baby boomer film, and that is nothing to be proud of if true. It does line up with the stereotypes though. Any way, despite everything, Jonah is a good man. He has been shown multiple times to be willing to lose money instead of sacrifice his journalistic integrity, he refused to jump on the anti-mutant bandwagon multiple times, and turned on a dim when a politician he supported turned oput to have severely racist views and started a crusade to expose the truth. And that was in the Stan Lee days. I think Peter respects that while Jameson may be unfair to him in the editorial section, he is a completely fair newsman in the rest of the paper. Plus, Robbie vouches for him. He just had a crappy father. It may not excuse Jonah, but it does explain him. He thinks the people he cares about most will ultimately betray him. When I did live in New York, one of the places was a week to week in Coney Island. I don't know how accurate it is for all of it or at all times, but there was a bit of a sketchyness. I also could see a part of an amusement park, and I didn't know if it was off season, or closed for repairs, but it looked abandoned. I also wasn't close enough to REALLY tell. I just kept wondering, "Did I move into a Batman comic?" I was always a little worried my place would be destroyed when the park blew up in a fight with Bats and the Joker. And I really wasn't sure what the rental policy is on that. I mean, do I get my deposit back? When I was very little, Coney Island still had its magic aura...then, as years passed, it was a place you wanted to avoid. I've heard that, in recent years, it's made a comeback, which is great. I recently talked to someone I know who lives in the city, and they told me that the area close to the park is coming back, but much of the neighborhoods are still places where you don't necessarily want to be after dark. Of course that's just what he said, every place has its seedy areas so... who knows. Isn't the real question about Jonah Jameson that if by his creator's own admission he was the basis... what does Stan Lee think of himself? I wouldn't read too much into that, Jack. All characters are, in some way, based on the writer. or at least reflections of their psyche. For instance, I can look at KRAVEN'S LAST HUNG and see that the three major players—Peter, Kraven and, yes, even Vermin—are reflections of aspects of my own psyche. Doesn't me that Vermin IS me in a literal sense, but he's certainly a part of me. That should be "doesn't MEAN that Vermin is me"! Any chance you'll eventually find yourself working with Giffen on the upcoming Blue Beetle series at some point? I doubt it. This one is Keith's solo gig. Please Dematteis, you are clearly a rat creature created by Nazi science. How else do you explain the glowing red eyes and love of cheese? But, Stan said he was the basis for Jonah. That is a tad different. It implies it was a conscious decision. Since you stomped all over my joke, I might as well get into this. There was a Marvel coffee table book about Marvel published in the early 90s. This showed some holiday cards and joke memos. In these teh joke was that Stan was a tyrant constantly changing things. He was an editor so, yeah... that makes since. What's more, he worked largely with freelancers, and as one I can say, we can get a bit touchy about our work being changed. And it only helps the bare minimum to know it makes it bettr in some way. in fact, most of Kirby's compkaints about Lee were Stan just doing what editors do. He made changes so the book would sell better. You can debate whether it was done in the right way, but I think that is why Kirby eventually came back to Marvel, he had that realization. However, i admittedly have a very... complicated view of Jack Kirby, given some things that happened in the 80s. And I have a little trouble looking past it at times, So, grain of salt. The point is, Jonah was probably inspired by that joke. All editors assume they are viewed like that, he just exploded it out. The Stan and Jack situation is a complex one. It's like dissection the Lennon-McCartney feud. It can make your head spin. I think Jack was a certified genius, perhaps the only one ever in comics, and the best visual storyteller, with the most astonishing imagination, that we've ever seen. I think Stan was a brilliant editor and writer with the ability to moved and delight his readership, bringing a never-before-seen intelligence and showmanship to mainstream comics. And I think that together they made some of the best comics ever. That said, Kirby's Fourth World comics remain my all-time favorites. And the first six issues of Stan's SILVER SURFER run, with John Buscema, are probably my favorite Stan stories ever. Interesting that you mention that you mention Lennon and McCartney. Lets be honest, the Beatles ended the Beatles. It was their egos, guilty over being more popular as the superior YArdbirds and the crippling depression that they would never be as good as the Rolling Stones. And it was ego that destroyed Lee and Kirby. Of course they buried the hatchet, which everyone seems to forget. The fact is Kirby needed Lee, Lee could break it down to the human level, whats more it was lee who made the characters come to life. As much as I love the 4th world, and I do, it has a lot of traditional Kirby problems. The flow is off, there is little to no structure, and Kirby's infamous tin ear for dialogue rears its ugly head. All things that.. what do you know... are probably caused by being his own editor. That means little to me though, Kirby's creative pros out weighs his cons. Even the childish Funky Flashman and House Roy (seriously what did Roy Thomas ever do to anyone) is easy to over look. My issue with Kirby is the 80s, and his decidedly unheroic treatment of fans that I object to. Don't Queens and Brooklyn share a boarder? ANd they say New Yorkers are distant. editor: Look, MArc, great script. The only problem is that there is no statue to a demon king in any major park in queens. You gotta be more aware of what is going on there if you are going to writer Spidey. JMD: I'm just playing with the mythology. Over at DC they just added A major part of the city full of new celebrations. O'Neil added a giant statue at one point. Who cares what we do to a fictional place, as long as its good. editor: ... okay. Here is a subway token, do me a favor and head to the site of the 64 world's fair. Marcy will tell you what trains to take. Take a good long look around, read the signs, talk to the people. I think you'll learn something. Again signs, read them. JMD: Okay, that's weird, but its your money and I need my J-O-B. I would say that Stan needed Jack just as much as Jack needed Stan. Just about every story I've ever heard about Jack interacting with fans defines a man who treated them with incredible respect and affection. Way beyond what most creators would ever do. But let's not get into a debate or trot out any negative stories about Jack. (Or Stan. Or anyone else!) I'd prefer to focus on what we love about those two guys. I think saying they both needed each other equally is an incredibly false equivalency. There is an old news adage, "people like reading about people." Its also true for all writing. That is why bad ideas can be saved by good characterization. It is also why it is harder to save bad characterization with a good story or idea. Whether consciously or not Lee lived and breathed that. This is why, despite there being a 20 issue point where Ditko plotted Spider-man, it is still fair to say Lee defined to book at the time. He was writing the dialogue and thought balloons. Hell, character was the whole basis for the Marvel revolution. Its why I still care about the books as an adult. Jack Kirby was a great idea man, no doubt. But in his decades of work, he never once understood that rule of writing. Not in one of his comics. Lets be honest, the Golden Age was not the best reading ever. Sure its fun, but even the best tends to come off lacking in charater most of the time. That was the problem with Kirby's 70s return to Cap, it was the personality of a Golden Age character again. Maybe even less so. The Mad Bomb, Cap's ancestor being a Captain America sort in the 1700s were great ideas. More importantly, they could have been mind for great character work, but weren't. Meanwhile, Lee was the one that made the character into one I loved in the 60s. Kirby's mind didn't work that way, his focus was too big. There is nothing inherently wrong with that. The Fantastic Four would have been a very different book without Kirby, probably ot as good. It would have still would have probably been very readable and made a big splash. The F.F> without Lee would have been... well, the Challengers of the Unknown, a great fun book, but little personality. I love Kirby's work, I do, I really, really do. That being said, there is a reason why after Lee his projects never really seemed to go on very long. That human element was missing. I would NEVER deny The Fourth world was mind blowing... but the question has to be, why did 2/3 of these books not make it past 11 issues? There has to be a reason, and when you look at everything going on in comics and the world at the time, it can;'t be that people didn't get it. That really doesn't track. If commercial failure (and people disagree on whether those books WERE commercial failures. I've heard a variety of reasons why the Fourth World was killed and not all of them had to do with sales) was a sign of low quality, then we'd be missing a lot of great art. Just about everything Orson Welles did after Kane was a "failure." And since he's died, many of those films have been hailed as works of genius. Not that I'd ever put myself on the same plane with a Welles or Kirby, but I've certainly had some of my very best work cancelled out from under me. But again: I don't want to debate. I love Stan, think he's brilliant. He was my hero when I was twelve and, in many ways, he still is. But I think Kirby was a genuine genius, ahead of his time in almost every way. In any case, I love 'em both and so I humbly end this back-and-forth and say, again, let's just celebrate both men and their extraordinary body of work. "I don't want to debate." I'm not sure that I understand that sentence. my WASP heritage finds that odd, but my Jewish side wants to ask, are you sure your one of us? Is loving a good debate just a Midwest Jewish thing? Just to be clear, I'm not saying Fourth World was cancelled to to low quality. It was amazing. I'm saying that it was cancelled because it lacked a human element for people to latch onto. Especially since it was what Marvel was known for, and DC used Marvel as a way to boost sales. JMD, you really should read TANGLED WEB #20, "Under the Mustache." You could find the details online but it's just not the same. Very possibly my favorite JJJ story of all time. It's funny, because every decade or so Stan Lee's answers change up. I hadn't ever heard that JJJ was modeled after Lee himself, but I look it up, and there it is! Lee has always said his memory isn't great, but I think there's more to it. Personally I think all his answers are true, because the characters he created are alive enough to carry the weight of multiple interpretations. During Lee's run, JJJ was played as a sensationalist who only cares about money, a villain actively funding the creation of monsters to fight Spider-Man, a comic relief figure whose blustering is matched only by his cowardice, and a principled journalist who will take a stand against racism even when it endangers his bottom line. Long story short, he's all these things and more. He's human. The first story that made me see Jonah differently was a Chameleon story arc by Gerry Conway in the late 80s. Jonah had been kidnapped and locked away in his own apartment, and while he tried to escape he recounted the first time he'd gone up against corruption (at the risk of his own life). Then you had the moment Jack mentioned, in an X-Men comic, where Jonah opposes Creed's bigotry. Another moment that sticks out is the time Jonah refused to let the Daily Bugle take it easy on Peter during his trial for Kaine's crimes, but privately funded his defense. And then there's "Under the Mustache," which is a great JJJ origin story. I agree, David. I always saw Jonah as complex and multidimensional. Not just a blustering caricature. Speaking of classic comics, I've read all the way through the Lee/Ditko Dr. Strange run in STRANGE TALES now! It's really cool how chaotic that run is, and yet it all seems to come together like some kind of master plan. Poor Doc Strange just bounces from one problem to the next without much of a breather! I'm now reading the O'Neill stuff with the origin of the Ancient One. Yeah, Lee & Ditko were really pushing the serialized envelope. My understanding is that the bulk of the plotting was Ditko's...just as it was on Spidey. In fact, if I'm not mistaken, at a certain point he got full credit for plotting the series. When you're done with this run, you should check out Steve Engelhart's run: the top of your head will blow off (in a really good way). I've heard great things about the Englehart run and I'm looking forward to getting around to it. Shouldn't be too long. Okay, everyone at The Waltz Compound has ready Scooby Apocalypse and even my youngest son who is pretty picky about what he reads thinks it's pretty cool. My wife said she likes the direction it takes from the original material. Looks like another hit, sir. Thanks, Douglas: glad everyone enjoyed it! I've heard that the first issue has sold out and they're going to a second printing. I saw the line up for the new Justice League cartoon. Looks good. Not sure about the 11 minute running time. Are you getting to write any of these? Not involved with the new JL show, Douglas. Much as I'd love to be! That's life in the freelance lane. And the way things work, I could get a call today asking me to write for the show. You just never know! You know what? Since you have done work with IDW before and they do a bunch of fantastic Godzilla comics you should pitch a Godzilla comic. I would so read that! It DID go through, Jack, but I went off and read the piece, retweeted it and forgot to post your comment. Sorry! So happy to see Mark's life and work being appreciated. Thanks for these! Actually, there have been two more, sorry. He does deserve those two... and more. I know you don't keep up on a lot of new comics out there, but I saw in the New Avengers that there is a new team called The New Revengers. A bunch of bad guys apparently. And guess who was front and center in the group picture? That's right, VERMIN. Can't wait to see how that works. In case you wanted to know the rest of the team line up; WHITE TIGER (female version) ANGAR THE SCREAMER,ASTI THE ALL SEEING , PAIBOK (A Skrull), and O.M.N.I.T.R.O.N.I.C.U.S. The Omni Computer. These are some pretty deep cuts for villains. Can't wait to see how that goes. Was Silver Age Green Lantern originally a... Marvel character? the look, the name, the occupation. Hal of two worlds? An inter-dimensional immigration? Better latkes in the Corps? Taking all bets. One thing is for sure... I smell crossover. I've seen weirder in comics. The second issue of SCOOBY-DOO APOCALYPSE was even better than the first. There are some genuinely frightening moments, and some poignant ones as well. Glad you enjoyed it, David. We're aiming for a nice mix of humor, scares and pathos. Glad it worked! Like the Ghostbusters cartoon, or Ghostbusters. Yep. And another model we keep referencing is ZOMBIELAND. Is it just me, or does the new Shaggy design look like Green Arrow? So with Marvel's THE CLONE CONSPIRACY coming up, they've been loading MARVEL UNLIMITED up with the 90s Clone Saga material. Re-read "Power and Responsibility" yesterday. Such a great kickoff to the story line. The concept of Peter having to choose between letting Judas Traveller kill the Ravencroft inmates or letting them go free is great. Looking forward to seeing what Marvel has in store for these characters later in the year. Perhaps the return of Ben Reilly? Y'know, he kind of does! I think that was aimed at my question. And congratulations on the book. I've heard nothing but good things about it. It's good to see that you didn't fall into the "Twilight Zone Principle." And there is nothing wring with using Ghostbusters as a model and only a little wrong with using Zombieland. On one hand I love Ben Reilly, and his return could lead to some great stories. It could also reestablish the marriage easily. By being dead, Ben would not be susceptible to Mephisto's influence, he remembers the Spider-baby. Since I hear that wanting kids is why MJ didn't marry Peter, then everything falls apart. I don't think that Marvel would use the character to his full potential. I think he would just be Spider-man in another city. It is like the Kaine Scarlet Spider series. Which I did enjoy, and buy every issue of. However, there was so much potential. He could have ben a Spider- MY NAme is Earl, and tried to repair his damage from before, he could have settled down, so that one Peter Parker at least could be happy... only to not be able to be happy. He faked being a criminal to take out crime from the inside. The possibilities are endless. Instead he was just Spider-man in Texas. Enjoyable, but frustrating given the possibilities. To me Ben Reilly would be at his best as a Spider-Kerouac. Like in the Lost Years. Sure he has a family in Peter now, but not really a place in the world. All the great stories, the VARIED stories, there is so much potential there. Maybe more than any other Marvel character. I wouldn't want him just to become Spider-man: Seattle. Mostly because it would probably just end with him as canon fodder in some big event. The course I would prefer is the head of this site listening to me and doing a series about Ben in those 5 years he was in exile, building a fan base, and then bringing him back. I will say, one of the biggest lost moments in comic history would have been a back up feature where Peter tells Janine Godbe that Be died. Could have been great. Ben's Lost Years still remain unexplored and there's so much story potential there (I did a short back-up a few years ago that established that Ben didn't just travel across the U.S., he traveled across Europe, as well; so the whole world is at play). As for a current-day series, I agree that Ben is, at heart, a traveler and would probably keep moving across the country, at least for a little while. What a great character. I hope they bring him back! The best thing is the potential. You could do any type of story, crime, slice of life, horror, even sci-fi, as long as it didn't get too big. I would love that. Marvel really should hire me. I know what's what. Potatoes. Potatoes are what. Also, Spider-Kerouac. Admit it, you want to go write that Peter and Jamnine scene and call Ben Reilly Spider-Kerouac, don't you? I admit it. Are you happy now? I'm never REALLY happy. I have a smug sense of self satisfaction. Does that count? Picked up the second issue of Scooby yesterday. It was interesting and I'm curious to see how the story develops. I don;t think we'll be able to blame Farmer Jenkins for this current predicament. Farmer Jenkins is now a six-armed mutant. Glad you enjoyed it, Douglas! You realize that if this doesn't happen somewhere in the course of the book I will feel disappointed.